When her mother is sick and nearing death in Gail Carson Levine’s Ever, Kezi and her family will do just about anything to spare her. When her father makes a promise to sacrifice the first person who congratulates him on his wife’s healing — assuming their god grants them Kezi’s mother’s health — it’s not long before the mother improves and Kezi’s aunt visits. Just as she’s about to congratulate Kezi’s father, Kezi jumps in and does it herself, thus dooming herself as a sacrifice. But nearby is the self-made outcast known as Olus who is a god unknown to Kezi and her family. His presence has been periphery since his arrival as a tenant of Kezi’s father, but he’s about to become more. Apparently drawing from many existing mythologies, Levine does an impressive job building her world and new mythology. Though the reader isn’t overwhelmed with details (this is, after all, a juvenile novel), the universe and explanations for it still seem quite complete. I don’t pretend to know of every religion or mythology out there and, in fact, checked quickly to be sure that Levine was not pulling solely from one existing faith or cast of gods. The world in which she works here feels well-established and seems to exist beyond the pages the reader is given. Levine lacks this skill in her development of Kezi and Olus’s relationship. Perhaps due to the target audience of the book, the chemistry between Kezi and Olus is practically nonexistent. Neither character, it seems, is developed enough to warrant feelings for the other. Kezi’s character is wrapped up in her love for her family and dance while Olus is mostly concerned with his identity of a god. Beyond this, neither character has a personality enough that there’s any substance for the other to fall in love with. While both characters are young, this does not fully explain the lack of character development and the consequential lack of chemistry. Though mythology and fables are often populated by characters with little definition as characters, for a novel-length work, this shortcoming has bigger consequences. Throughout the entirety of the story, Levine uses a stylized prose which helps to build the world and explain the lives of the characters. In alternating first-person perspective, both Kezi and Olus have similar — though not identical — voices. That said, the style is a little distracting and melodramatic. Though its richness might be appropriate for a less observant, younger audience who needs something with a stronger flavor, the strength of the prose style is such that it might be distracting for older readers. Ever likely would have worked better for a young adult audience, though the plot might have been a little more trite in that space. While the world is well-developed, Levine falls short with her characterization, chemistry, and, in some ways, the prose. The conflict at times feels contrived rather than natural and this is underlined by a similarly contrived-feeling solution to the conflict. 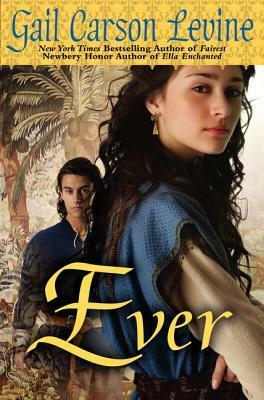 Ever is pleasant enough, but isn’t a stellar novel for any audience.